Activision Blizzard (ATVI) will need to warm up investor sentiment on Tuesday evening. The shares are bumping slightly higher in early Tuesday trading ahead of its fourth-quarter earnings report after the market close. Still, that is little comfort for investors that have seen the stock halved since the start of the fourth quarter. Analysts are anticipating $1.29 in earnings per share, which would represent a major leap from a year earlier, with the consensus revenue estimate at $3.04 billion, which would again be a significant jump compared to fourth-quarter 2017. "The fact is, this is a what have you done for me lately business," Jim Cramer explained ahead of the release. He added that Activision will need to take a page from Electronic Arts' (EA) book and surprise investors with a new game or project in order to reverse course. "It's entirely possible that [CEO Robert Kotick] has something up his sleeve," Cramer said. EA will certainly be a good stock trend to follow, with that stock leaping nearly 10% in early Tuesday morning trading after revealing the runaway success of its Apex Legends game that is billed as a major Fortnite competitor. "The immediate success of the surprise launch of Apex Legends from EA's Respawn might end up being more important to the stock over the long term than guidance for a lackluster 4Q," said BMO Capital Markets analyst Gerrick Johnson in a recent client note. "EA now has a solid entry into the battle royale genre that is generating a lot of buzz and dominating Twitch viewership since release." Such a surprise would be revelatory, as the flop of Destiny 2, and the subsequent separation of the Bungie development team that created it, leaves Activision reliant upon older releases like Call of Duty, World of Warcraft, and Overwatch. That becomes a problem in an industry with such a brief memory, as Cramer noted. The company is also bereft of a meaningful competitor to Fortnite's and Apex Legends' popular battle royale style based on the lack of new Call of Duty titles. Call of Duty is even losing some market share as titles such as Counter-Strike: Global Offensive (CS:GO) rise in popularity among streamers and online players as a new installment remains unseen. To be sure, the names in the company's intellectual property book remain some of the best-selling games of all time and cannot be discounted. Additionally, the Overwatch League, Activision's eSports effort, has recently announced many high-profile sponsors to help monetize this secular trend of online sports. With corporate standbys like Coca-Cola (KO) , Toyota (TM) , and Intel (INTC) behind the project, it is becoming clear that the revenue behind this league and the broader eSports movement is plentiful. It certainly helps that Overwatch is the top 10 earner in terms of eSports games globally. 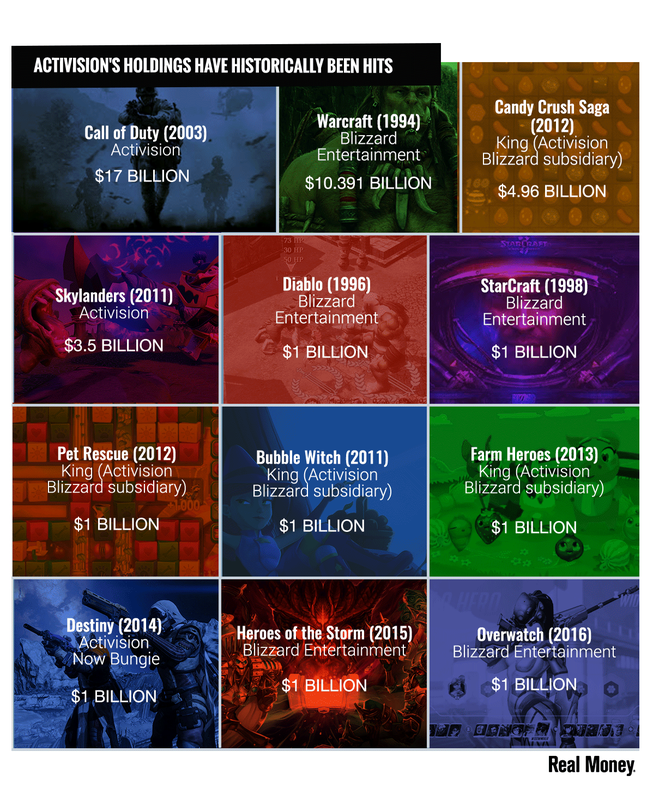 "Blizzard revenue should grow by $11 million from Diablo III: Eternal Collection, the Overwatch League, and higher World of Warcraft subscription revenue," Wedbush analyst Michael Pachter explained. "For King, Candy Crush Friends Saga and ads should generate incremental revenue of $44 million." Pachter maintained a "Buy" rating on this basis, but severely trimmed his price target from $81 to just $64 as optimism remains tempered on the stock after a period of disappointment. However, there is not expected to be a new release in the catalog of its best-selling games until a new Call of Duty installment in the fourth quarter and the less-novel release of World of Warcraft Classic in the summer. That leaves many wondering about short-term catalysts. They need to buy a developer. They have nothing in the pipeline. They are definitely having issues. It becomes even more difficult to forecast a pipeline after the news of massive layoffs shook the stock earlier this week that adds to the top down flight of talent from the company. Many will recall the abrupt firing of CFO Spencer Neumann, who departed for Netflix (NFLX) earlier this year, the coming exit of Activision Publishing CEO Eric Hirshberg, the loss of Blizzard co-founder Mike Morhaime at his CEO post and expected departure from advisory roles in April, and the departure of Blizzard CFO Amrita Ahuja to join Square (SQ) earlier this year. That's a significant number of high-level officers jumping ship in an incredibly short period of time and obviously adds uncertainty to the company's ability to right the ship and kickstart much-needed development. "We expect more investors will begin to 'kick the tires' on ATVI as we get closer to mid-2019, when chatter regarding the 2020 pipeline intensifies," Piper Jaffray analyst Michael Olson anticipated amidst the dearth of exciting releases. He noted that 2020 looks significantly stronger, with many more realizable catalysts upcoming in the pipeline. For that outlook to accelerate to the near term, the stock will need to prove it has indeed found a bottom. Many investors will be holding out hope that the surprise Cramer hints at is indeed in store.